Holly Maxwell has been sharing some incredible finds with us from the collection of her late mother, Beverly Fairall-Maxwell—photos and mementos literally from EVERY era in Laurel’s history, including some pieces dating all the way back to the 1870s! We’ll have them scanned and added to a History Contributor page as soon as possible this summer. Kevin wrote a two-part “History Matters” column last year on the history of the recently demolished Laurel Theatre building at 312 Main Street. Check out his page for even more of his research that didn’t make it into the papers. As this eventful year draws to a close, let’s take a quick look back at some of the positive things that came out of the past 12 months. Last December, the Laurel History Boys organized an informal and nostalgic roundtable discussion with Mayor Craig Moe and each of the living ex-Mayors of Laurel—including Mike Leszcz, Joe Robison, Dani Duniho, and Robert DiPietro. Moderated by Kevin, the event was filmed at the Laurel Police Department’s Partnership Activity Center. In January, Rich was named the Laurel Historical Society’s Volunteer of the Year. He has donated graphic design services since 2014, producing the exhibition graphics for the Laurel Museum’s past three annual exhibits. During renovations in February, Pete was able to save a limited number of historic stadium seats from the Laurel Park grandstand, including a few complete wooden chairs dating to 1954. If you’re interested in acquiring a full seat or a numbered plastic seat back, please contact us. In March, Rich saw firsthand the Stefanie Watson cold case saga finally come to a close, when he joined her family at the killer’s sentencing. His 2012 Lost Laurel blog post about the crime’s 30th anniversary—the first piece written about the crime in three decades—helped prompt detectives to fasttrack the DNA testing that ultimately convicted John Ernest Walsh of the crime. Stefanie’s story finally received national attention when On the Case with Paula Zahn aired “A Nightmare in Laurel”. May’s Main Street Festival marked the second straight year that we’ve ridden in the parade in Mike Templeton’s beautiful 1956 Chevy Bel Air, but little did we know it would be the first of three parades for the Laurel History Boys this year! We had the honor of being named Parade Grand Marshals for Laurel’s 4th of July Celebration, and just a few weeks ago, rode in the Christmas parade, as well. Our participation in the 4th of July parade also garnered another pretty cool honor—front page of the Laurel Leader! 2016 will be long-remembered for its remarkable number of celebrity deaths; but closer to home, there was no tragedy more unexpected than the murder of beloved Tastee Diner waitress Windy Floyd in August. Windy always took good care of us during our frequent Diner visits, and we felt the need to do something to help her kids in the wake of this nightmare. The GoFundMe page we established has raised over $3,400 for her daughter, Lacey; and Diner staff and customers raised an additional several hundred dollars through on-site fundraising efforts. On a brighter note, this past year also saw an increase in speaking engagements for us, as we were invited to give presentations to the Savage Historical Society, the Friends of Montpelier, and the Laurel chapter of the American Rosie the Riveter Association. We also saw a couple of Laurel landmarks demolished (literally) in 2016—the Laurel Theatre/Petrucci’s Dinner Theatre at 312 Main Street and the Laurel Town Lodge at 41 B Street—and had the unique opportunity to tour the vacant properties as guests of Sorto Contracting before they were demolished. Blaine Sutton of Sorto helped ensure that some pieces from both old buildings were preserved, and we’ll be producing videos about each place’s history as soon as possible in the new year. As the clock ticks down on 2016, we hope that 2017 will bring nothing but good things and wonderful new discoveries—and look forward to sharing them with you. Happy New Year! Did you know that Laurel has a chapter of the American Rosie the Riveter Association? These ladies were hard at work on the homefront during World War II, and we were extremely honored when they asked us to give a presentation last Saturday about what was happening in Laurel during that era. Richard Friend, Kevin Leonard, and Pete Lewnes with the Rosies: Rena Van Buren, Lorraine Miller, and Wilma Foster. We gave a brief year-by-year recap of various events, and then focused on three stories from the war years—including Kevin’s recent article about the civilian internees and prisoners of war held at Fort Meade. 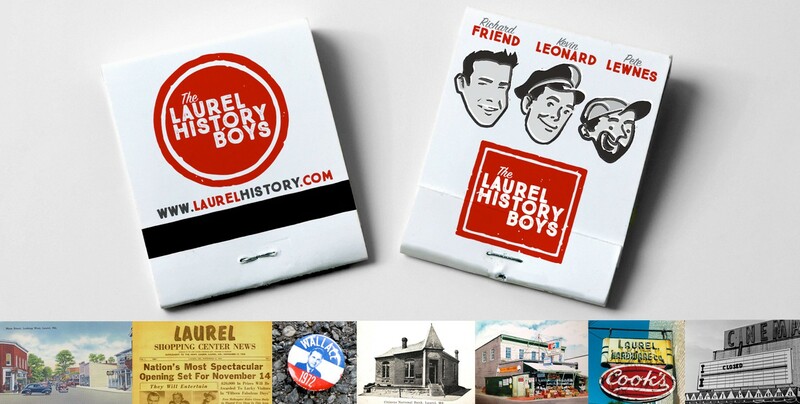 And for show and tell, Pete brought an array of artifacts from his massive Laurel memorabilia collection. But it’s difficult to tell a more inspiring story than that of the Rosies themselves, and to have these three remarkable women present was truly an honor. During the war, Rena Van Buren was a shell casing inspector who knew soldiers’ lives depended on her accurate work. Lorraine Miller was a Department of Justice stenographer, who met her husband while volunteering at Laurel’s USO club (now American Legion Post 60). And Wilma Foster worked as a riveter at Fairchild Aircraft in Hagerstown. Wilma’s daughter, Ann Marie Miller, is the President of the Laurel chapter of the American Rosie the Riveter Association. Lorraine and Eddie Miller, who met at Laurel’s USO club. Lorraine, second from left, with other USO girls. Lorraine enjoys perusing some vintage Laurel memorabilia. Many thanks again to this wonderful organization and its members, as well as the First United Methodist Church at 424 Main Street, whose Fellowship Hall hosted the event. One of Kevin’s most popular “History Matters” columns was his excellent overview of the legendary Laurel Pop Festival of July 1969. Along with a synopsis, he’s added some photos that didn’t make it into the article over on his page—check it out here!